Hello friends! Life has been crazy, busy, and full of changes, but there are lots of exciting things happening (especially with wedding planning)! From dress shopping, to work deadlines, and drafting guest lists - I'm certainly keeping myself busy. AH! I turn 25 next week! I will be spending my birthday (week) in Boston with my main man, which I am really happy about :) Though I've been once before, I'm looking forward to exploring a little more. If any of you have suggestions for restaurants, cute shops, or things to check out, please let me know! I have been challenging myself to take more pictures, so it's going to be fun to photograph a different city. This week, I am working on setting up our wedding website, doing extensive research for our invitation suites (which I will be designing), and finalizing our save the date cards to send to our out of town guests. If you follow me on Pinterest, you know I have been going a little crazy with wedding inspiration these past couple months. But in all seriousness, it's been such a useful tool in the planning process (not to mention that I've been pinning like it's my job for a couple years now.. haha)! As we are sending out our Save the Date this week, I thought I would share some of my favourite Save the Date designs from across the interweb. So feast your eyes upon these pretty pieces of stationery. / 1 / These Save the Date tags, by Seattle based designer/photographer, Carina Skrobecki, are actually made with rubber stamps (which I think is great)! I have had a small obsession with stamps since I was a little kid. They are so fun to make. I also love that these little notes are an alternative to the regular postcard style! I really like the simplicity of the design, and the focus on typography. 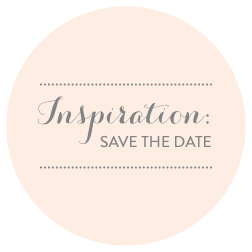 / 2 / I have been really drawn to more simplistic designs for our Save the Date. Though I love calligraphy, I feel like a lot of wedding stationery gets, for lack of a better word, a little too flowery. These beauties are from Minted. I like the sans serif typeface a lot, and think that it looks really lovely next to the floral line drawing - which is my favourite part! / 3 / I love the pastel shades of the Save the Date matchbooks! They were an item on Etsy, listed by the shop, Twig & Thistle. The punny message is super cute. The matchbooks are also letterpressed, which is the piece de resistance. Again, I am really into the idea of giving out invites in the shape of something else! The possibilities are endless.. Matches, coasters, magnets, buttons, pins - so much fun :) I think that giving out a little something that your potential guests can actually use + keep is a sweet idea. / 4 / Did I mention how much I love the Carolyna Pro Black typeface. It's amazing. So many ligatures and flourishes to choose from, and it lets me use a script that is actually legible! YES! Is that so much to ask for? Anyways, I love this typeface, and I really like this Save the Date card by Susan Brand Design. The rounded edges, and the colour palette are also lovely. / 5 / I thought the idea of sharing a cute photo of you and your sweetie + writing your date on balloons was adorable! If I were to do this, I would have used those giant circular balloons that I see floating around on Pinterest. I just want to incorporate them into our wedding decor so badly! / 6 / The watercolour treatment from the Etsy shop, Leveret Paperie, on this Save the Date is what drew me in. Soft and romantic, this pretty paper good fits with our wedding theme perfectly. As an added bonus, it has a circular die cut. / 7 / Another design from Minted, I really liked that this card played with typography. Also, just the fact that it's for a destination wedding made me all nostalgic for the time that Pedro and I thought it might be possible for us to get married on a beach somewhere. While we are super excited for our big Italian wedding, it would have been nice to get away with our loved ones! / 8 / I thought this photo Save the Date was so cute! The little doodles are adorable. Sweet and playful, this perfect postcard would have your guests smiling in no time! / 9 / I saw a lot of calendar themed Save the Dates, but this was by far my favourite. Funnily enough, it's actually a free printable! The banner is beautiful, and I really liked the leafy details. I love the rustic elegance of this card. The hand-drawn typography is such a nice touch! Hope you enjoyed my little round up! I will be sure to share our Save the Date design and wedding website once we've sent them out to our guests. I mentioned that I have been trying to take more photos lately. After my little shoot with my dress the other day - I started thinking about clothing, and my relationships with my clothes. I took these photos today. I really liked them, so I thought that I would share. I think I'm onto something here. I have a really good idea that I'm super excited about. I am thinking medium format and some large, gorgeous black and white prints.